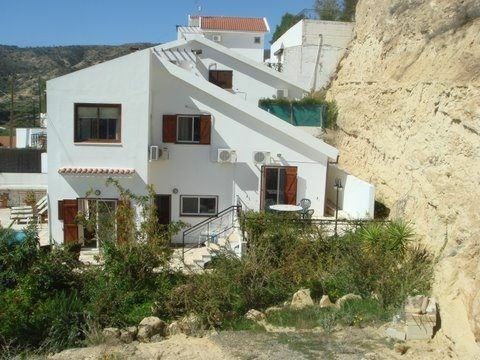 Well appointed, air-conditioned villa with pool, situated on a hillside with spectacular sea views. The exceptionally good beach and environmentally friendly sea meet the EU Blue Flag Standard for water quality. There are 3 supermarkets at Pissouri Bay to meet all your needs and on the outskirts of the village near to the police station and chemist there is a large supermarket that sells fresh meat and fish .At the top of the hill is Pissouri Village which has a very nice village square with many restaurants and bars,also a bank. Sports: Pissouri Beach has a fantastic amount of water sports on offer including water skiing, windsurfing, para-gliding, sailing, fishing, snorkelling and of course swimming. There are also opportunities for diving. Golf: There are three golf courses in the immediate vicinity, one being the Secret Valley golf course only ten minutes drive away.. Clubs and trolleys can be hired but it is essential that you ring and book your slot. There is another at Aprodite Hills 10 minutes away, an equally friendly course. and a new one called Elia on the B road to Paphos .It is a big open course with a very nice club house. All these courses are very picturesque and welcoming to visitors. Full details of these in villa. Other activities: There are plenty of opportunities for walking as the villa in built on a gentle hillside where there are a lot of walks, wild flowers and spectacular views. There are waterparks in Limassol and Paphos and also a go-kart track near the water park in Paphos. There are also plenty of opportunities for sight seeing such as a highly recommended trip to the Troodos mountains and Omodos. If you a fancy a bumpy ride, a jeep safari with lunch included, to the Akamas peninsular and Lara Bay can be arranged. We are a retired couple who live for most of the year in Jersey . We visit Pissouri as often as we can as our son now lives here. He is always on hand if there is anything you need to know or any problems arise. Beautiful view. .. Very near the beach . Pool which is attended to twice a week. Free WiFi. Within waking distance of shops beach and restaurants. House towels are provided but guests are asked to bring their own beach towels. There is also a travel cot available. There is an ice maker in the fridge. Sky news only at moment as no satellite . All football matches available at pub 400yds down road. DVD player and an assortment of DVDs and videos. My Vision which has a selection of English programmes plus movies. Guests are asked to vacate the property by 11am on the day of departure. Pissouri Bay is on the south coast of Cyprus exactly equidistant between Paphos and Limassol (34 km). It is situated in a pretty wine growing area of Cyprus. The main village of Pissouri is situated on top of a hill with far reaching views over the countryside and sea and in the distance the Troodos mountains.